1This study examines an ecological disaster and a massacre unheard-of in Western Europe in times of civil peace. Based on original sources, it takes a broader look at and questions the very functioning of the Restoration system, drawing on both national and local sources. The national documentation is from the Ministerio de Gobernación, preserved in the Archivo Histórico Nacional and from the dossier on military intervention preserved in the Archivo General Militar in Madrid. Locally, the documentation from the Fundación Río Tinto has been supplemented by a survey of the archives of the principal municipalities concerned. The work is organised in five chronological parts, from the origins of the problem of the «Huelva fumes» through to the epilogue and its memorialisation. 2The first part, «The invasion of the fumes», introduces the subject in two dimensions—one temporal, from the beginnings of mine working and the introduction of open-air pyrite calcination using the teleras system, and the other spatial, covering the western part of the basin where the first protest movement emerged at El Alosno in 1877, against the British company Tharsis, pioneers in mass sulphur pollution. The expert commission sent on this occasion minimised the damage and were sidetracked by the companies. A few years later, the large-scale pollution reached the east of the basin, with the purchase of the State company by the Rio Tinto Company in 1873, and calcination of ever-increasing amounts, which swiftly passed the one million and then the two million tonne mark. A new protest movement during the winter of 1880 came to nothing, but it did lend the cause nationwide projection for the first time in the shape of a deputation to the Cortes of representatives of the towns affected. This development finally made clear—to the alarm of observers of the time—the extent and seriousness of the consequences for the environment, cultures and persons. The region was fast becoming literally unliveable-in. 3The second part, «The basin catches fire», first analyses the forces aligned: the foreign companies, confident of their power, local elites with no strong national links but increasingly well organised, an apparently inert population of workers, headed by an enigmatic leader, Tornet, and a State apparatus whose formalistic procedures masked other realities, such as the power of the big local chiefs or the de facto autonomy of a poorly-controlled civil governor. The chronology of the movement's resurgence highlights the importance of the political juncture in the lag between the intensification of the pollution and the outbreak of protests, which began with a vengeance at Calañas in the spring of 1886. The strategy that was adopted, thereafter legal and «municipalist», was founded on the responsibilities and powers of mayors in matters of public health. The movement spread in the autumn of 1887, with a campaign of telegraphic assault on the State, in response to the manoeuvres of the mining companies and the elites in the provincial capital in favour of calcination. The new minister of Gobernación, Albareda, discovered the extent of the problem when the Council of State upheld the decision of a protesting municipality. This victory and the minister's declaration to Parliament of his awareness of the suffering of the local populations, raised hopes among the townspeople but did not quieten spirits, particularly as British interests, and especially the Rio Tinto Company, launched a political counter-offensive through convoluted channels. 4The third part, «the massacre», is able to provide a blow-by-blow account thanks to telegraph records. The pace of events picked up after mid-January 1888, with a heightening tensions around Riotinto and the convergence of two protest movements, labour and environmental, based around Zalamea. The refusal of the new local management of the Rio Tinto Company to countenance any kind of concession was met by labour mobilisation and led the authorities to prepare expressly for repression by violence in a district where policing forces were undermanned. All sources confirm that the demonstration of 4 February was massive and peaceful. It has been possible to reconstruct the course of events, up to the arrival of the governor and the firing of shots, with no warning, by troops deliberately placed in the midst of the crowd. The records provide evidence of the collusion of the authorities on the scene in trying to cover up the outcome and evade individual responsibilities. 5The fourth part, «From stupor to oblivion», shows that, despite the thunderous denunciations of Francisco Romero Robledo and Juan Talero, the debates in Parliament served only to play down the affair. The Restoration system emerged unscathed from the debates, and the only concrete action was an injunction ordering the progressive suppression of the fumes. Moreover, the affair was quickly forgotten by a national press focused on parliamentary debates, and also by the labour press. 6The fifth part, «End of decree, end of fumes», analyses the two sides of the outcome of the crisis. The first is the fear instilled in the rural and working populations of the basin. The second is an offensive by the companies, and especially Rio Tinto, to secure suspension of the injunction, on three fronts: political (local and national), legal and medical. This last, which was essential to justify the withdrawal of a measure taken in the interests of public health, throws light on the personalities and medical institutions implicated on either side of the battle. The issue of the fumes was finally resolved at the beginning of the 20th century, with the conjunction of other forces, technical innovations, and the disappearance of personal interests. The scars remain, as does the memory, with its gaps and its reinterpretations. CHASTAGNARET, Gérard. 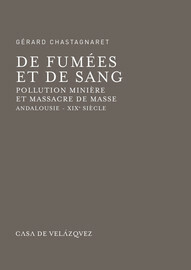 Summary In : De fumées et de sang : Pollution minière et massacre de masse. Andalousie - xixe siècle [en ligne]. Madrid : Casa de Velázquez, 2017 (généré le 21 avril 2019). Disponible sur Internet : <http://books.openedition.org/cvz/3787>. ISBN : 9788490960929. Chastagnaret, Gérard. “Summary”. De fumées et de sang : Pollution minière et massacre de masse. Andalousie - xixe siècle. By Chastagnaret. Madrid : Casa de Velázquez, 2017. (pp. 409-411) Web. <http://books.openedition.org/cvz/3787>.